A drunk drug-addict sneaked into a woman's bedroom, took her bank card and then used it repeatedly to buy cigarettes, a court heard. Zohaib Khan, who also stole £15 cash, had struck when he used the toilet at the home of Marion East, who knew him. The 20-year-old had sent her a Facebook message asking if he could go round to her house for drinks, but ended up breaching her trust. Khan, who spent about £24 on the victim's card, is already on a community order, on which his attendance and cooperation were said to have been " non existent." 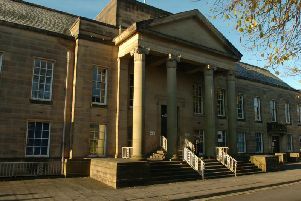 Burnley magistrates were told he had been "in the grip" of an addiction to hard drugs at the time he stole. Mrs Tracy Yates, prosecuting, said Marion East thought the defendant was taking a long time after he asked to use the toilet. When he returned, he appeared to be acting suspiciously and couldn't keep still. He went, leaving the front door open. The victim messaged Khan, but he at first denied what he had done. He then apologised, saying he was drunk at the time. Mrs Yates said the defendant later took the card back, but Marion East cut it up and threw it away. She found out the card had been used three times in the hours following the theft, for just over £8 each. The prosecutor continued: "At first, he denied any involvement in the theft of the bank card. He was asked if he would go on a VIPER (video identification) parade and at that stage made a full admission." Khan told police he had had a lot of vodka, was very drunk, did it to buy more alcohol and had never intended not to pay the money back. Mrs Yates added the victim confirmed the defendant had repaid her. He had seven offences on his record. Mr Keith Rennison, defending, said the offence was committed on impulse. The solicitor continued: "He had gone to the victim's address, they had some alcohol together and rather foolishly he took her bank card and some money. The bank card was returned within days." Mr Rennison said: "At this time the defendant was regrettably in the grip of an addiction to Class A drugs. With the help of his family, he took himself back to Pakistan for help through the withdrawal procedure. He returned in January and since then has been offence-free." The solicitor told the court Khan was now working at a taxi base and added: "He is currently not in the grip of the addiction which was causing him the problems at the time." The defendant, of Southfield Street, Nelson, admitted theft, last October 6th. He was given a six-month community order and must go to an attendance centre for 18 hours. Khan was ordered to pay £85 costs and an £85 victim surcharge.